1. Leadership and Vision. 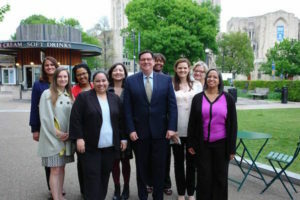 Pittsburgh Mayor William Peduto launched Welcoming Pittsburgh soon after taking office in 2014 and remains a champion for the city’s growing immigrant and Latino communities. With nearly 40 recommendations outlined in the comprehensive plan, Mayor Peduto is striving to make Pittsburgh a more welcoming city where all residents have opportunities to be civically engaged and to thrive economically. The Mayor seeks to grow Pittsburgh’s population by 20,000 residents in 10 years and shares that the best attraction strategy starts by investing in current residents. the heart of the city’s university community, after our first full day of meetings. 2. Many Partners, One Message. During our visit, we were able to meet with more than 20 different community partners from various sectors including economic development, human services, libraries, universities, faith-based, and refugee resettlement organizations who are involved in a range of welcoming efforts in their day to day work. While each of the organizations had a distinct mission, their message was the same: Welcoming immigrants is part of Pittsburgh’s past and future. 3. Storytelling and Placemaking. During our visit to The Global Switchboard, we learned how videos are used to bring visibility to local immigrant communities, were transported to India through virtual reality glasses, and participated in a short storytelling exercise to share highlights from our visit. We were also inspired by the stories shared as part of Welcoming Pittsburgh’s 30 Neighbors, 30 Days campaign launched to connect Pittsburghers to the diverse faces in their city and build unity with a simple hashtag: #IamPGH. 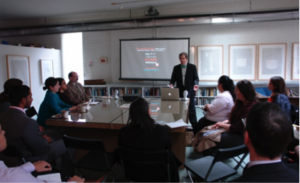 Our two-day visit was not a collection of meetings at long tables with the requisite Powerpoint presentations. Instead, our hosts introduced us to places like City of Asylum that provided opportunities for people to connect and learn about different cultures through literature, poetry, and music. The stories and places helped to highlight immigrant contributions in business, education, and the arts in visual and tangible ways. 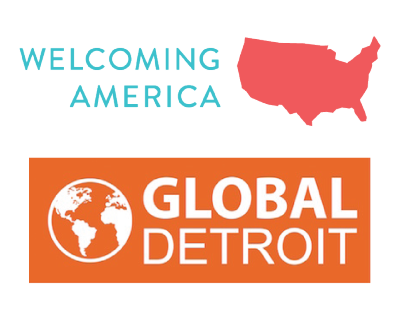 Our Welcoming Cities team will explore using social media to tell more immigrant stories and we also will look at how we can create more welcoming spaces like the International Marketplace that showcase our city’s diversity and help to strengthen our message that we value and welcome immigrants. 4. Community Engagement. 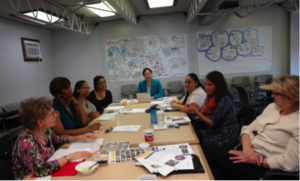 The Welcoming Pittsburgh planning process brought together 40 stakeholders—from frontline staff to executives—to serve on the Advisory Council and build the roadmap for the years ahead. Through this yearlong process, Welcoming Pittsburgh engaged more than 3,000 community members with public surveys, community meetings, and one-on-one interviews. 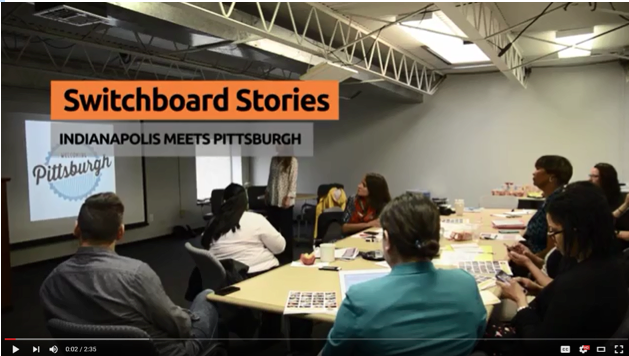 Pittsburgh is known as the city of bridges, and we were able to see the many ways Welcoming Pittsburgh seeks to build bridges between immigrants and Latinos with their new hometown. Whether they’re hosting public naturalization ceremonies, multilingual city walking tours, welcoming bike rides, or working to address the workforce and entrepreneurship gaps many immigrants face, what we heard loud and clear in Pittsburgh is: partnerships matter and our cities are stronger when we work together. 5. Celebrating Immigrants. One of our Pittsburgh counterparts emphasized on the first day that the Welcoming Pittsburgh plan is more than a list of recommendations. Instead, the plan is a way to recognize and celebrate immigrants and the contributions they make to their city. We were able to see firsthand how Pittsburgh is developing a model for celebrating and welcoming New Americans. 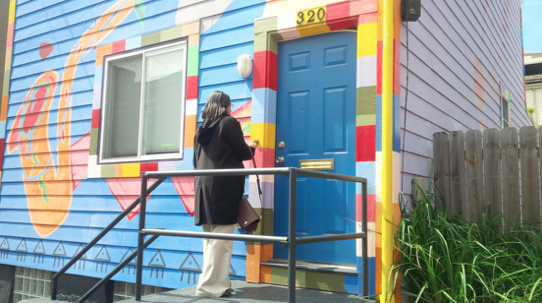 Upon ringing the doorbell, this City of Asylum house plays jazz that can be heard throughout the neighborhood – building a connection between the city’s jazz history with residents. Talk about a warm welcome! Listen here. We want to thank the WE Global Network for making this trip possible through their city-to-city grant program. We also want to thank Betty Cruz, deputy chief of special initiatives in the Mayor’s Office, for coordinating our visit and for sharing her insights and her city with us. We look forward to a continued relationship with Welcoming Pittsburgh, and want to extend an official invitation to their leaders to come and visit Indianapolis so we can continue to learn from one another.